With forty-six states and the District of Columbia implementing the Common Core State Standards (CCSS) a bevy of new research and resources around the CCSS has been released in the last month - with more to come. Earlier this month Dr. William Schmidt released key conclusions from his research analyzing how the Common Core State Standards for mathematics have the potential to improve the performance of U.S. students, if implemented appropriately. In an event co-sponsored by Achieve, Chiefs for Change and the Foundation for Excellence in Education, Dr. Schmidt presented a briefing on his work: Common Core State Standards Math: The Relationship Between High Standards, Systemic Implementation and Student Achievement. Schmidt explained during the event that the CCSS for mathematics strongly resemble the standards of the highest-achieving nations, and that they have more focus, coherence and rigor than most of the state standards they replaced. He also found states with standards most like the CCSS for mathematics have higher scores on the National Assessment of Educational Progress (NAEP), demonstrating that standards - and implementing them well - matter. 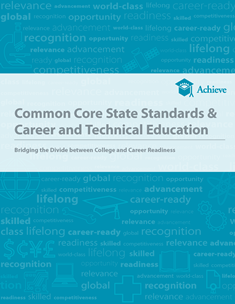 Achieve is focused on supporting states as they transition to the CCSS and has created and amassed a range of communications, implementation, and other tools, all found at Achieving the Common Core.